Many remarkable characters played their roles on the Elks'-Wyandot stage during its too-brief existence. The Kaufmans, Denny Shute, Johnny Florio, and others we have yet to encounter, are all luminaries who contributed to the club and course. 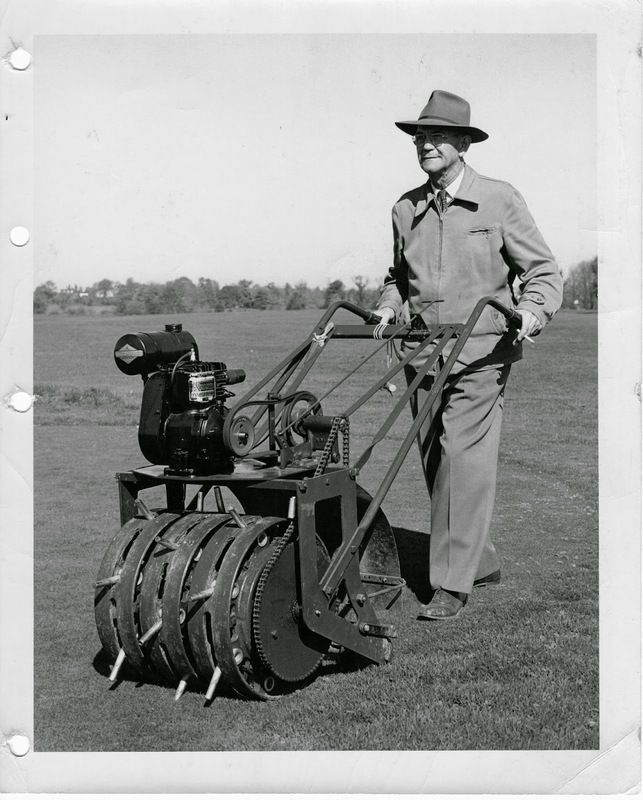 But of all the illustrious personages encountered in researching the club's history, I admire most the club's long-time greenkeeper (not "greenskeeper" because the entire course must be kept "green" - not just the 18 greens) Lawrence Huber. I admit to bias on this point as in the course of this project, I became friendly with Lawrence Huber's son Jim, his daughter-in-law Betty, and grandson Bill. But I suspect objective observers would concur that Lawrence Huber deserves the praise I heap on him in this account. He certainly overcame a tough start in life. Born in 1893, he was orphaned at age 2. He spent most of the next fourteen years being cared for at the "Odd Fellows' Home for Orphans, Indigent, and the Aged" located in Springfield- about an hour west of Columbus. The "Independent Order of Odd Fellow" was founded in England, and brought to America in 1819. The order dedicated itself to the proposition that "the strong support the weak, the well nurse the sick, the learned instruct the unlearned, and the rich help the poor." The Springfield home, opened in 1898, was largely a self-sufficient operation with its own farming operation which provided the home with fresh produce, dairy products, and meat. For many, their image of a turn-of-the-century orphanage conjures up a bleak specter of a desultory poorhouse where unfortunate children lived a life of hardship experiencing little in the way of love, comfort, education, or useful training. Indeed, the number of orphanages dwindled in number during the 1900s as foster care and other care arrangements surpassed orphanages in public favor. Lawrence Huber left the Odd Fellows' Home in 1909 at age 16 with the equivalent of an eighth grade education. But whether it was in spite of or because of his residence there, he nevertheless emerged with an impressive skill set. He possessed high aptitude for working with motors and other mechanical devices. He had no trouble taking them apart and putting them back together again. While his reading and writing abilities were not exemplary at this stage of his life, he offset this limitation by an uncanny ability to perform complicated arithmetic problems in his head. He was also a young man who did not shy away from hard labor. Lawrence was well aware that it would take unstinting work on his part to overcome his underprivileged beginnings. 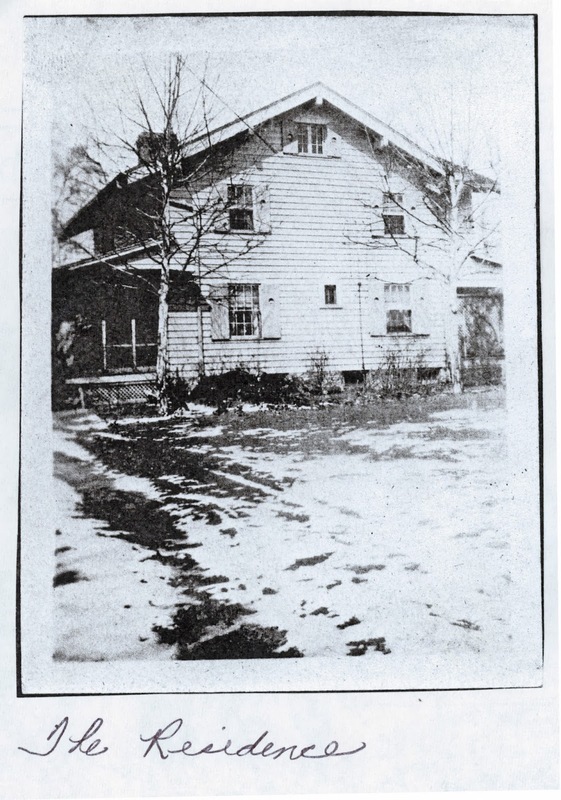 The orphanage arranged for his first outside employment at a farm in Jackson County, Ohio in the foothills of Appalachia, about an hour south of Columbus. The mechanical implements available to farmers were extremely rudimentary, and farmers were often faced with the task of having to repair these implements on their own without instruction manuals to help. It is likely that the need for trial-and-error problem-solving at the farm resulted in exceptional training for his job at Elks'-Wyandot. Always looking to better himself, Lawrence moved from the farm and took a position in Columbus with the Pennsylvania Railroad. He was employed there as an "express messenger." Typically Huber would ride the rails between Columbus and St. Louis (a route over the portion of the Pennsy's lines called the "Panhandle"), and be gone from home days at a time. 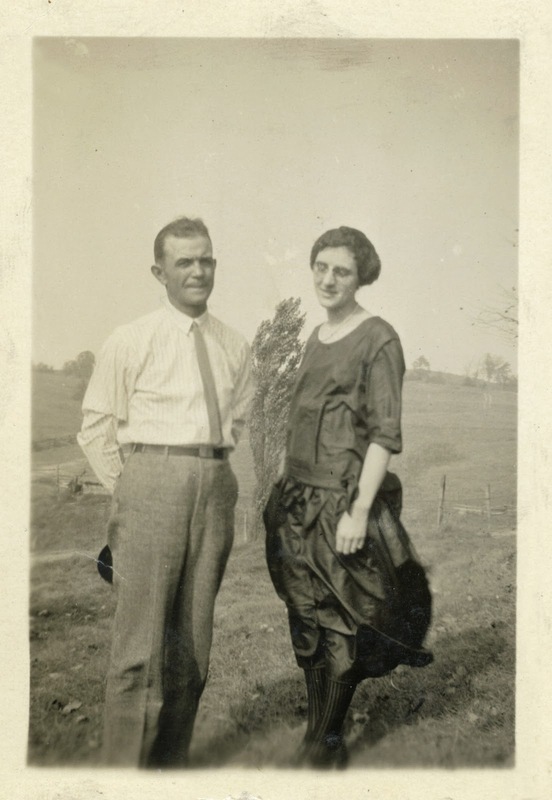 During his railroad days, Lawrence met Eunice Daugherty who lived on a farm in Alton, a tiny hamlet just west of Columbus on the National Road. It seemed a good match for sure, but Lawrence was probably a little hesitant to get hitched because his required absences from Columbus would likely not be conducive to matrimonial bliss. Fate intervened when Lawrence got wind of the greenkeeper opening at The Elks' Country Club in the spring of 1922. At first blush, it is surprising he was considered for the position since it is doubtful he had stepped foot on a golf course. But he had a couple things going for him: there were still farming operations involved at The Elks'- a holdover activity from the Higgins' estate days. Lawrence had that base covered. Secondly, he was a young man of 28 who could grow with the club. Also, Elks' management presumably concluded that Huber had shown evidence of being a quick study who could learn on the job by observing Donald Ross, soon to be at work laying out the course. Lawrence would have eventually married Eunice even had The Elks' management's not told him in no uncertain terms that the club wanted a married man to fill the post. But his desire to obtain the job certainly hurried the nuptials along. In short order Mr. and Mrs. Lawrence Huber occupied the frame house on the property that the club had reserved for the greenkeeper. Eunice was very supportive of Lawrence's career, accompanying him to various state and national greenkeeper association conclaves. Eunice bore Lawrence three children: Bill, Jane, and Jim. By all accounts, the Hubers were a happy family. Lawrence and Eunice made good friends with their fellow greenkeepers like Bridgeview's Grube and Columbus Country Club's Hoover families. Marilyn Gohlke Strasser (mother of Dan Strasser- a several time Brookside Golf and Country Club champion) remembers wonderful picnics shared by the Gohlke and Huber families. Many were held at the Huber residence adjacent to the golf course. Marilyn's mother Lydia met Eunice when they worked together at Smith Hardware in downtown Columbus. 75 years have not dimmed Marilyn's fond memories of Lawrence. "He was a great man whom you looked up to. He was kind to all of us kids. He was a quiet but strong man. And he would play the accordion at our get-togethers quite well! The Hubers were a very musical family. They were a close-knit family who helped each other out. My understanding is that there were even a few occasions where Eunice helped out with the mowing of the greens when Lawrence was short-staffed." Lawrence Huber had a unique opportunity to learn from the best. He accompanied Donald Ross when the great architect staked The Elks' in 1922. Since he was brand new to the game at that time, he probably had no concept of Ross's importance in the world of golf. Still, he was amazed how the architect, with nothing more than a level in his hand, could quickly and unerringly determine appropriate tiling to enhance drainage. Ross believed attention to drainage to be the single most important factor in golf course design and maintenance. Huber took this lesson to heart. Lawrence also immersed himself in the details of The Elks' manual fairway sprinkling system- a high-end investment for the fledgling club. 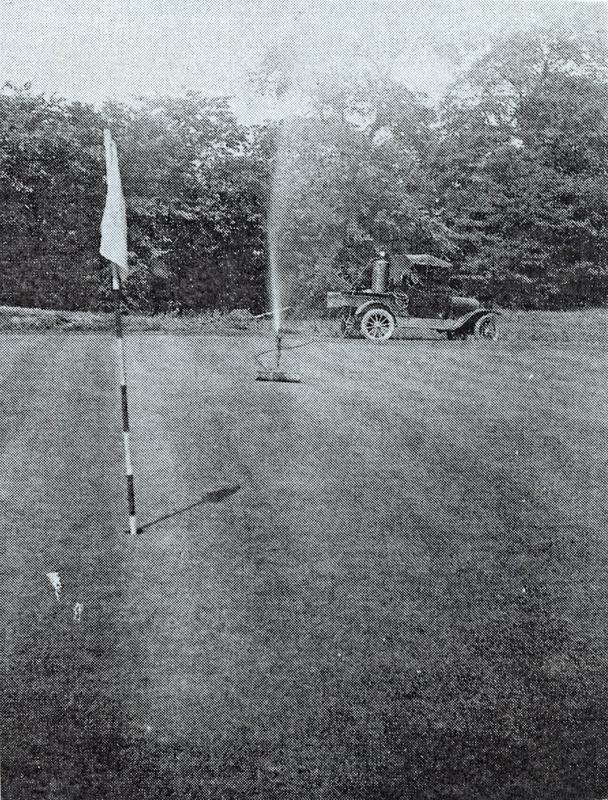 In 1922, greenkeeping was still a relatively new profession. Production of maintenance equipment was in its infancy. The best turf for golf and methods for avoiding weeds, topdressing and rolling of greens, as well as a myriad of other aspects of maintenance were subjects still open for debate. 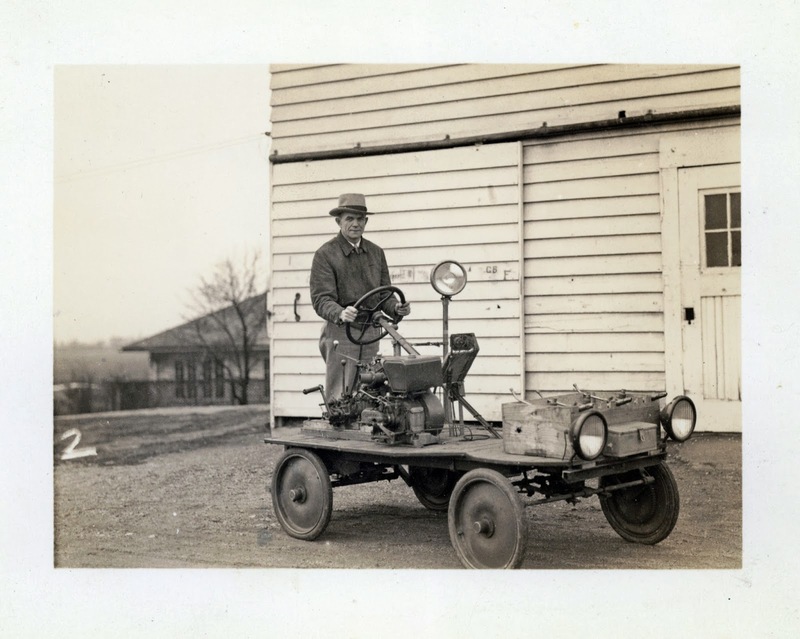 To figure out for himself the solutions to the problems of his trade, Lawrence voraciously read the greenkeepers' trade journal, "The National Greenkeeper," and became actively involved in the National Association of Greenkeepers of America when it was formed in 1926. Though his formal scientific training at the orphanage was minimal, he habitually applied the "scientific method" in testing the efficacy of material applications. Renowned golf course architect Bill Amick, who grew up around the course and knew the Huber family well. recalls one such experiment by Lawrence. It involved the circular and slightly hogback shaped first green. Amick relates that, "it was not only a green, but a test plot for seven or eight varieties of bent grasses. Those were planted like pieces cut out of a pie. Lawrence wanted to study and compare how various bents performed under actual course conditions. He told me that one problem with this test was that changing cup locations took extra effort in order to avoid the introduction of one kind of grass into another piece of the pie. This would have happened using the conventional method of simply placing a plug of sod from the new cup into the old cup in a section of different bent grass." Lawrence became so enthused over his various tests that he eventually began writing about them in "The National Greenkeeper." An example of this was his published letter discussing how he dealt with an outbreak of small brown patch. He prepared an experimental plot of 10 strips ten feet wide, and then applied 10 different fertilizers on each individual strip. He found that the best fertilizer for small brown patch to be "cotton seed meal, 100 pounds per 5000 square feet." For "large brown patch," Lawrence wrote, "I top dress greens with good compost and apply sulphate of ammonia, the rate dependent on how hot the weather is." 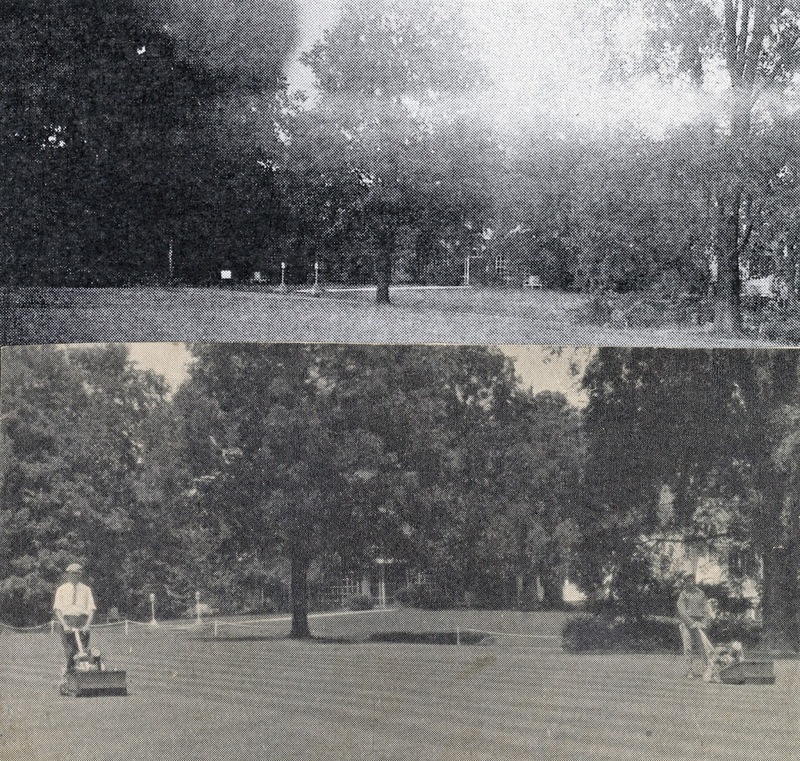 He also reported to the magazine's readers that lighter rollers worked better on its bent-grass greens (son Jim says that his father told him that at the time it was planted, The Elks' was the only 18 hole course in the United States in which all the greens were planted in "creeping bent" grass). Lawrence's findings were based on a test over several weeks in which lighter rollers were applied to the greens of The Elks' front nine while simultaneously using heavier rollers on the back-side greens. Huber even weighed in on the subject of whether greenkeepers should play golf. Though he had trouble breaking 100, he expressed the view that it was a good idea to play occasionally because the greenkeeper could thereby "find out the condition of the course in the way that regular members have of finding out." Lawrence recommended playing with the pro or green committee members early in the morning, as this affords the greenkeeper an opportunity to "bring up anything pertaining to the improvement of the course." Lawrence's ability to conceive of and fabricate workable maintenance machinery was astonishing. Below is a mobile pump he hooked up to a truck. He found a way to use a gasoline-powered motor to agitate pressure-filled tanks to apply fungicide to Elks'-Wyandot's greens. 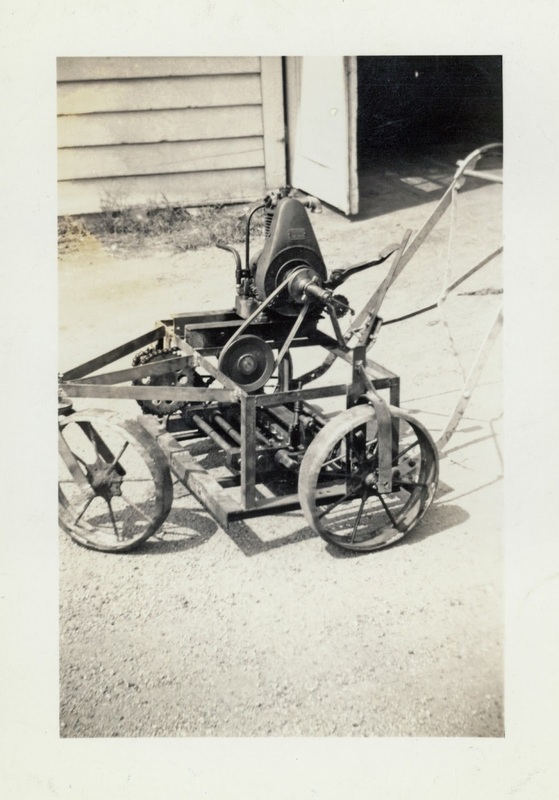 When weed killer came into use around 1944, he used a similar apparatus at Brookside to spray the fairways. This eliminated the omnipresent white milky dandelions (often confused at a distance with golf balls) that had previously plagued course maintenance. 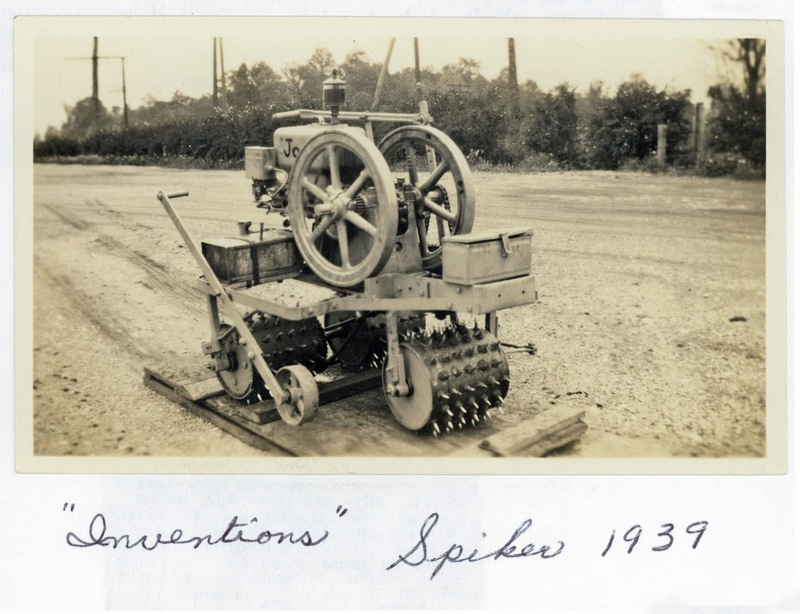 Lawrence's best and most complex innovation was his motorized "spiker," used to areate the fairways and greens. Lawrence Huber's experiments with technology were not limited to golf course equipment. In 1927, he assembled the forerunner of a television. His short-wave receiver was able to pick up a discernible silhouette image sent by a signal from Washington D.C.
His insatiable thirst for knowledge led Lawrence to enroll in agronomy courses at Purdue University. Huber's professional achievements led his peers to name him president of the Ohio Golf Superintendents Association in 1939 (Lawrence succeeded in his campaign to change the description of the job in the industry to "superintendent" which he felt better described the job's comprehensive administrative duties). The poor orphan with an 8th grade education had definitely pulled himself up by his bootstraps! Lawrence was proud that he had come so far, and thus was never reluctant to reveal his humble background. Lawrence Huber served as Elks'-Wyandot's greenkeeper (or superintendent as he would prefer) from 1922 to 1943. He then left the club and signed up as an agronomist with the U.S. Corps of Army Engineers. The family was afforded government housing in Columbus, but Lawrence traveled to air bases in five states to work on landscaping projects. According to son Jim, there were two reasons Lawrence left Wyandot and joined the Corps of Engineers: (1) he was disappointed that the government had exempted him from service during World War I because it did not want to take farmers into the service, and he thought that joining the Corps during the new conflict would be of service to his country; and (2) he could see the "handwriting on the wall" that Wyandot's days as a private club were numbered. In his view, a private club's members always helped the greenkeeper care for the course by repairing ball marks and divots. That was not generally the case with public golf courses. Lawrence probably would have acknowledged that he was a little spoiled on this point, but he simply had no interest in dealing with the headaches that go with maintaining a public facility. In the course of his service with the Corps of Engineers, Lawrence, directed labor performed by German prisoners of war. The officer in charge of the prisoners refused to allow them sufficient water breaks even during broiling summer weather. Huber registered complaints up the chain of command seeking humane treatment for the prisoners, but was rebuffed. Disenchanted with the officers' conduct, Lawrence and sought and obtained an early exit from the Corps in 1944. Lawrence soon was back in the course superintendent business, this time with Brookside Golf and Country Club in Columbus. Brookside's course had suffered terribly in the war. The bunkers were solidly laden with weeds, and the membership dropped to perilously low numbers. Brookside had come close to closing down completely. Son Jim remembers that the family moved into the second floor of the clubhouse above the kitchen. The Hubers had never paid for housing since Lawrence and Eunice had been married, but the cramped living conditions convinced the couple that it was time to own their home. After six months in the clubhouse, the Hubers found one to their liking and moved to their own residence. Brookside was in such a precarious financial position at that time that Lawrence had to accomplish most of the work without staff. Young Jim, only 12, recalls that the Greens Committee chairman Harvey Bible offered him a job. Jim wound up clearing weeds at $1 per bunker. Once Lawrence saw that the weeds were so thick that it was taking the boy a full day to clear a single trap, he pulled him off of that project. 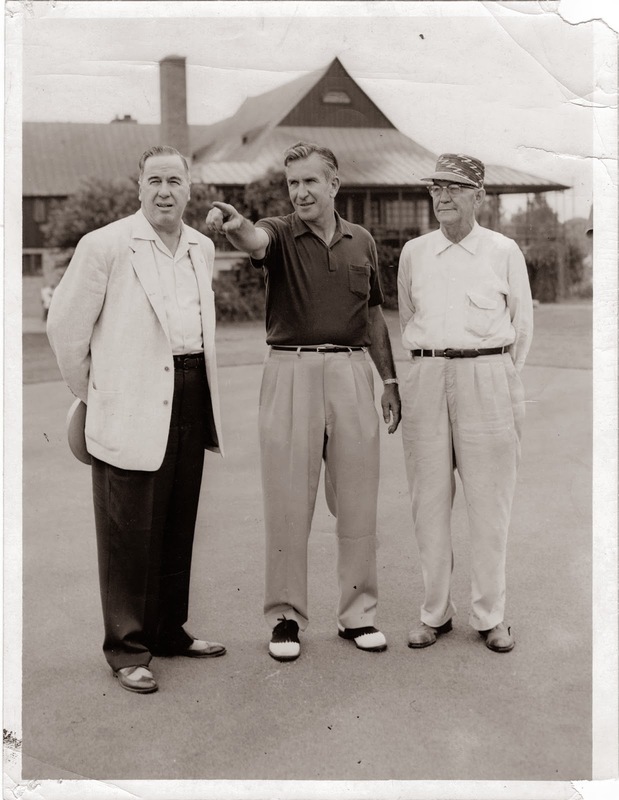 Under Lawrence Huber's stewardship, Brookside's course was gradually brought back into fine shape. He was gratified that the membership numbers picked up once he turned the condition of the property around. After five years at Brookside, Lawrence moved to his last work stop to the position of Superintendent at the two Ohio State University golf courses- the "Scarlet" and the "Gray." Jim continued working with his father in the business until entering the Air Force. Another worker on Lawrence's OSU's crew was the aforementioned course architect Bill Amick. Lawrence facilitated Bill's obtaining of a graduate position in turf management at Purdue University that became the springboard for Amick's still-active career in golf. Lawrence Huber (right) at O.S.U. While Lawrence was hopeful that his sons would also become superintendents. Jim, having witnessed his father habitually working seven days a week, wanted no part of it. He stayed in New Mexico and spent his career as an air traffic controller. Son Bill also sought other business opportunities. After marrying Betty, he spent his career with the Columbus Forge and Iron Company. He died eleven years ago. Betty still lives in Columbus very close to the long gone golf course which her father-in-law maintained for 21 years. I first learned of Betty Huber when in the process of a google search for information about The Elks' Country Club, I landed on Shirley Hyatt's excellent "Clintonville History" blog. Betty was listed as the source for some information and photos of the course contained on the blog. I contacted Shirley to ascertain how to reach Betty. Shirley responded that Betty had recently passed away. Still, I felt it could be productive to contact Betty's surviving members of the family. I found the obituary for "Betty Huber" who had lived on the north side, and called the gentleman listed as her son- Jack Huber. Jack after hearing me express condolences for his loss, and then discuss my golf research project, volunteered that he had just played golf that November day. After five minutes of conversation, he suddenly asked me, "Where was this golf course exactly?" Something was amiss here! 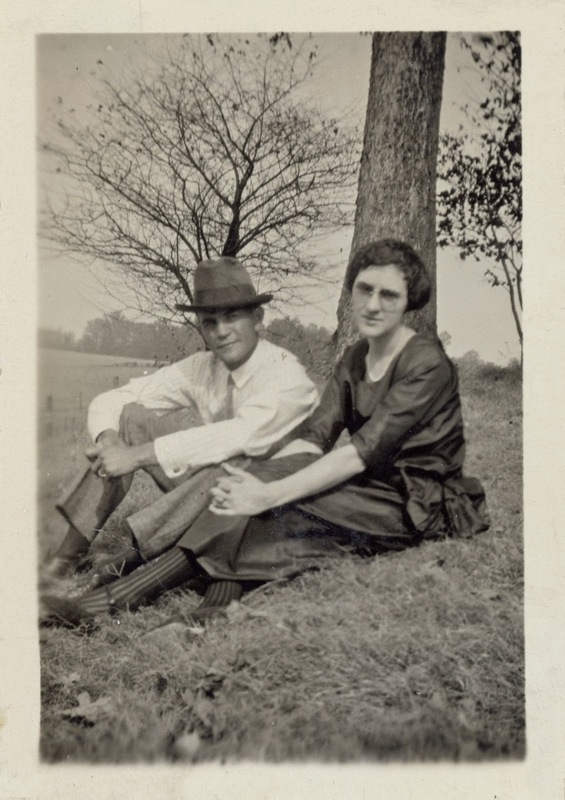 While Jack's mother was indeed named Betty Huber, Lawrence Huber was not his grandfather. It dawned on me that there had to be a second Betty Huber in Columbus. Further internet research paid off in my finding her. This Betty- the same age as the Betty who had just died, was alive, well, and Lawrence Huber's daughter-in-law! Moreover, she possessed a treasure trove of pictures, scorecards, and memories that are sprinkled throughout this story. Betty has been most patient and helpful with this nosy researcher. Lawrence's daughter Jane was actually the best golfer in the Huber family. She became an accomplished singer, and she performed with a prominent chorale group in Atlanta. Jane died too young of ovarian cancer. Lawrence Huber died of lung cancer in 1958 at age 65 while still toiling as Ohio State's superintendent. Jim says no one ever enjoyed his job more than his father. He also says his father was the most honest man he ever knew. When I asked Jim how Lawrence, with his limited education, invented and innovated the way he had, he responded, "I don't know. It's amazing isn't it!" Next chapter: "The Last of the Wyandots"